I'm always on the hunt for primary sources for information about the bike stuff I'm interested in. Pictures, catalogs and the like. Words may lie, but pictures...well, they can lie too, but I'd rather be fooled by a period picture thats been retouched than by the recollections of a guy who worked in a store with a guy who worked for a manufacturer who's founder was a mechanic of another guy who's cousin rode with Eddy Merckx. Sure, I'd still like to hear their story, but I'd take whatever I heard with a grain of salt. 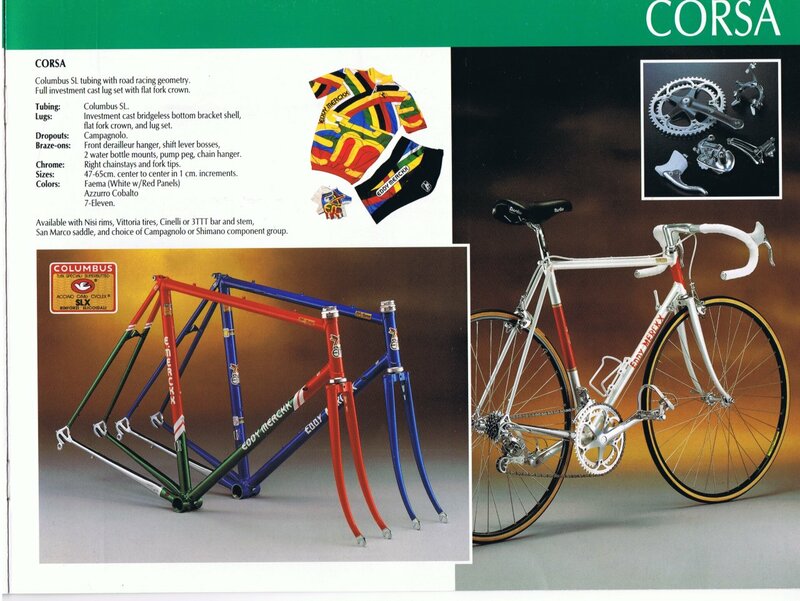 I recently picked up a 1990 Merckx catalog, that isn't (yet) in the enormous bike catalog archive that Mark Bulgier has. I've seen this catalog a few times on eBay, and loathed the fact that it wasn't scanned and available online. It's up on bulgier.net in full resolution now. Get it here. 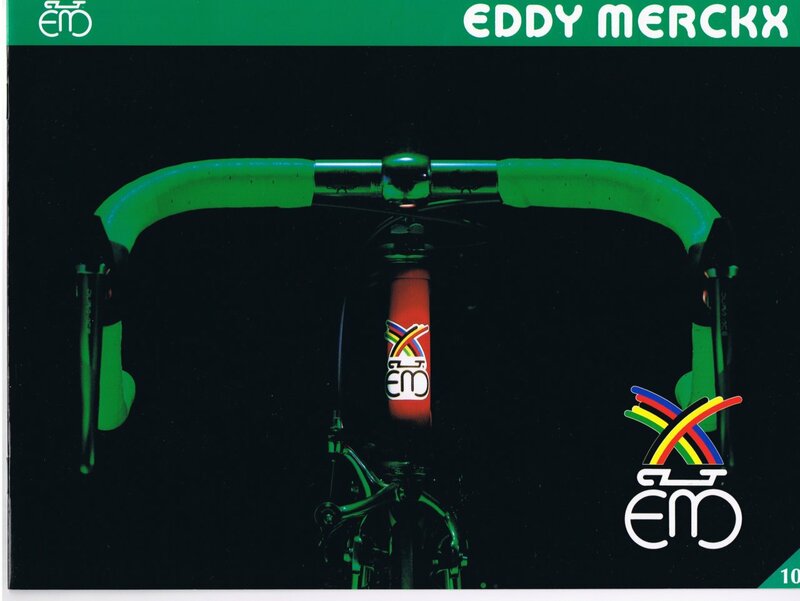 If you have this catalog, and never made it available to me and other Merckx addicts, I'm very dissapointed in you. 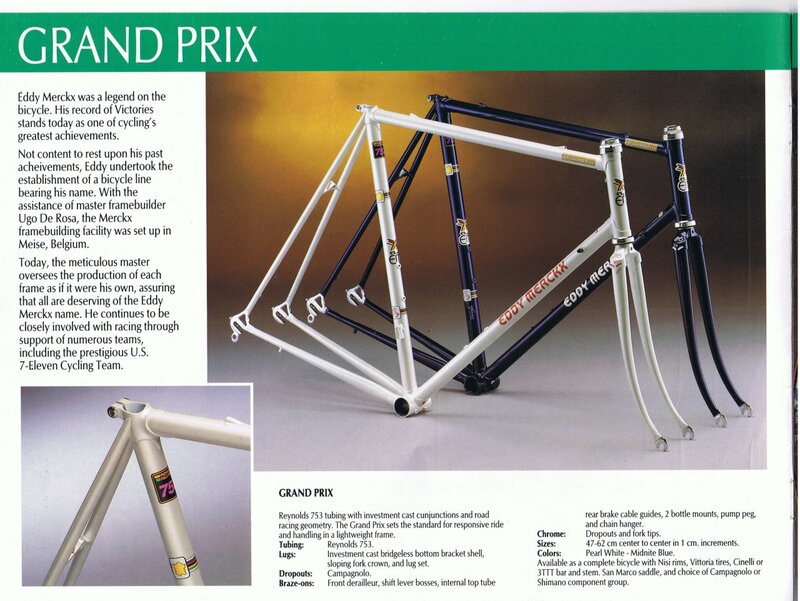 Anyone who's read this blog knows it was a Grand Prix that got me all excited about Merckx bikes. Mine is an 88/89, so it predates the above, but its very, very similar. 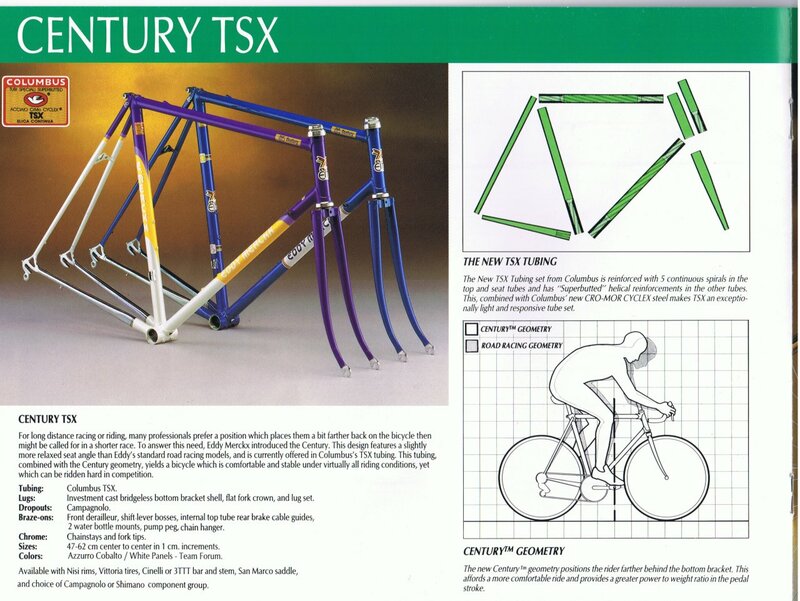 My current thought is this catalog is from early 1990, as I believe they switched the way they did internal routing in 1990, from both cables on the top of the top tube, to the entrance tunnel being on the lower side of the top tube. I guess 1990 was when they decided non-aero brakes were dead. 10th anniversary frame. Whats interesting about these is a large percentage of them bear a B date code, which indicates they were actually built in 1988/89. I'm guessing late 1989 is more accurate, which makes sense -- model year 1990 frames are usually available prior to the end of the previous year. Century TSX. Note the different internal routing. The entrance tunnel is out of sight, on the under side of the top tube. New team color scheme too? Team Forum? Never heard of them -- can anyone tell me more? The Team 7-11 frame. I think this is effectively a Century in 7-Eleven colors. 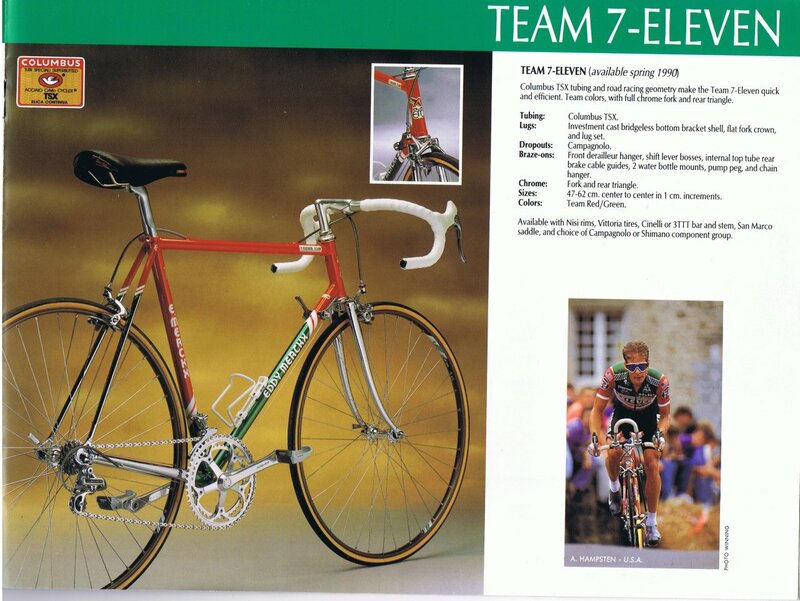 Note the presence of a 7-Eleven Team decal on the top tube. 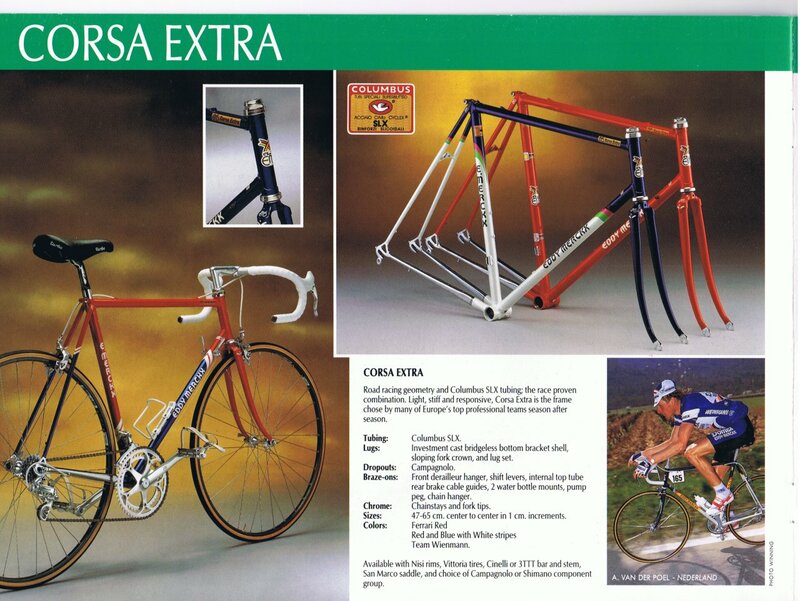 Corsa Extra, in the 1990 Weinmann color scheme -- perhaps my favorite of all the color schemes. Someday one will be mine. Also present is a color scheme I assumed was a team one which just appears to be a stock color scheme. Corsa. The Faema reproduction is a beauty, and you can't go wrong with either the 7-Eleven color scheme or the blue. No 7-Eleven Team sticker here. Pista in SL, sporting a Corsa decal. Simple + attractive in blue. 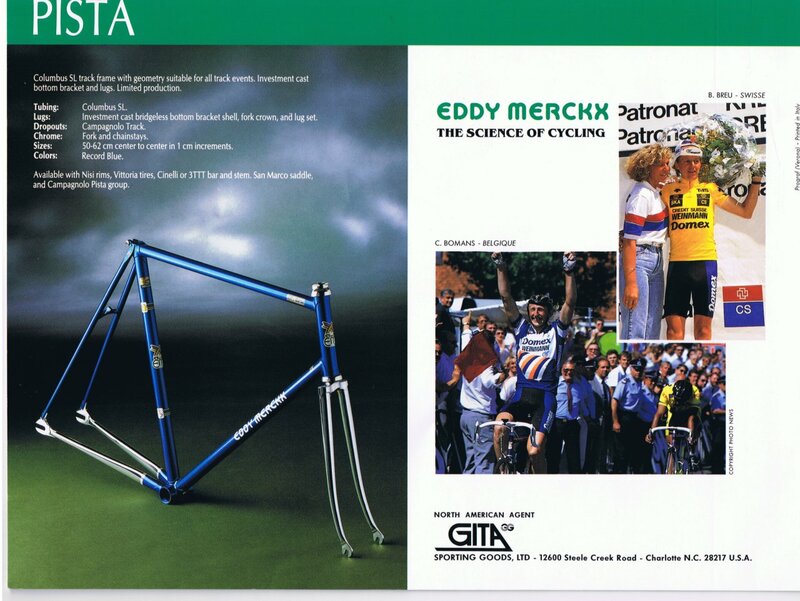 Have any Merckx catalogs that aren't at the Bulgier archive? If you don't have a scanner, I'm more than happy to scan for you. There's no good reason for people to pay ridiculous amounts of money for an 8 page catalog, when its so easy to scan and make them available to others. Would be grateful for any kind of information, thanks, stijn! Sorry mister Jeremy, sorry for my english. 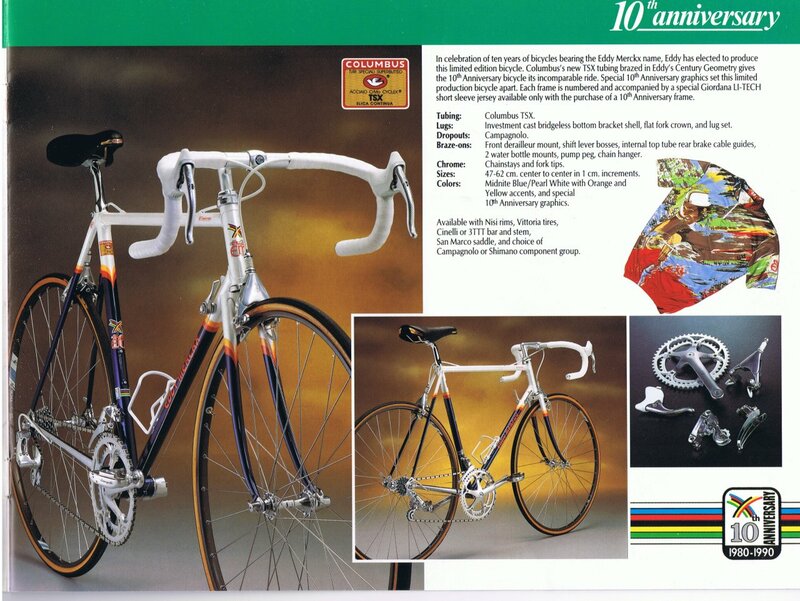 I have an eddy merckx CORSA in 7-11 paint scheme. 2 years ago eddy signed the frame and now i want to buy an original groupset campagnolo for this frame! Alessandro, go to my serial decoding page here: http://www.cadre.org/Merckx/ or email me a picture of your bottom bracket and all of the numbers on it, and I will provide details.